How do you live if you know when you die? As the Guardian writes, this moving, original novel of destined futures and second chances has ‘a magic rare enough to leave one astonished’. 'January 21st, 2044’. Her voice is matter-of-fact, as if she is stating the temperature, or the winner of the ballgame. ‘You got plenty of time'. Over the years that follow, the siblings must choose how to live with the prophecies the fortune-teller gave them that day. Will they accept, ignore, cheat or defy them? Golden-boy Simon escapes to San Francisco, searching for love; dreamy Klara becomes a Las Vegas magician; eldest son Daniel tries to control fate as an army doctor after 9/11; and bookish Varya looks to science for the answers she craves. 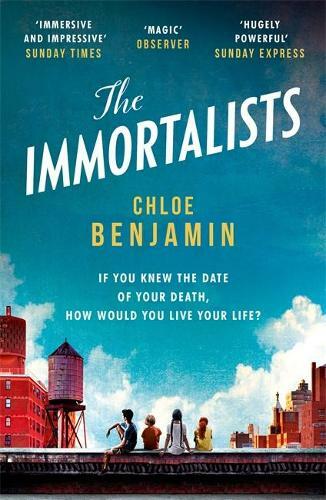 A sweeping novel of remarkable ambition and depth, The Immortalists is a story about how we live, how we die, and what we do with the time we have. The work of a startlingly original voice, as the Daily Mail comments, ‘such is her dazzling sureness of touch that you wonder if here is a writer who is truly capable of anything'. If you could know exactly when you are going to die, would you try to change your fate or accept it? This was the question four Gold siblings had all their lives. I had heard a lot about this book and after reading can best describe it as unusual to say the least.